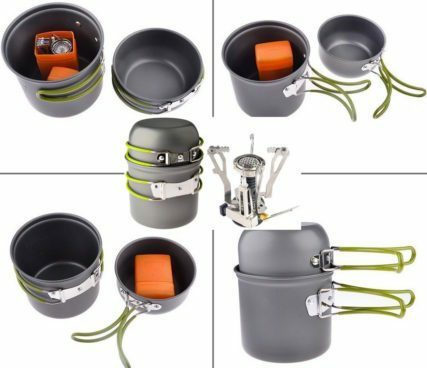 Perfect Outdoor Cooking Utensils: Package includes one non-stick pan pot bowl set, one collapsible piezoelectric ignition canister stove. This outdoor cooking set is designed perfectly for one or two people. Extremely Durable Material: The lightweight high-temperature resistant cooking pan pot bowl set is made of FDA approved Non-Toxic anodized aluminum, which makes it solid and durable. Our products are many times more durable than anything else on the market. Easy Packing & Taking: Tired of those huge, clunky cooking wares? Try out our Cookware. Both the cooking set & stove have foldable handles for space saving and compactness. Convenient & Safe: High-energy ceramic piezoelectric ignition system makes the stove very convenient for outside camping or hiking, picnic, BBQ (Barbecue). Cookware compact and collapsible designs of combined with the carrying case or bag for enhanced portability. Excellent equipments for camping, hiking, overnight trips or any other outdoor activities. All Petforu branded products have a 24 months warranty that begins on the date of purchase. If there are any product quality problems, please feel free to contact our customer service agents for help.